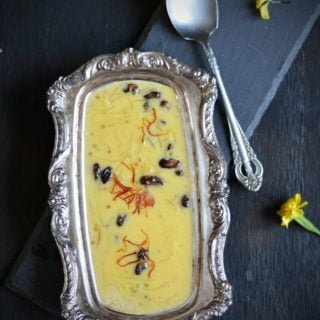 Mango Semiya Payasam, a rich dessert served on festive occasions and marriage feast in Southern India. 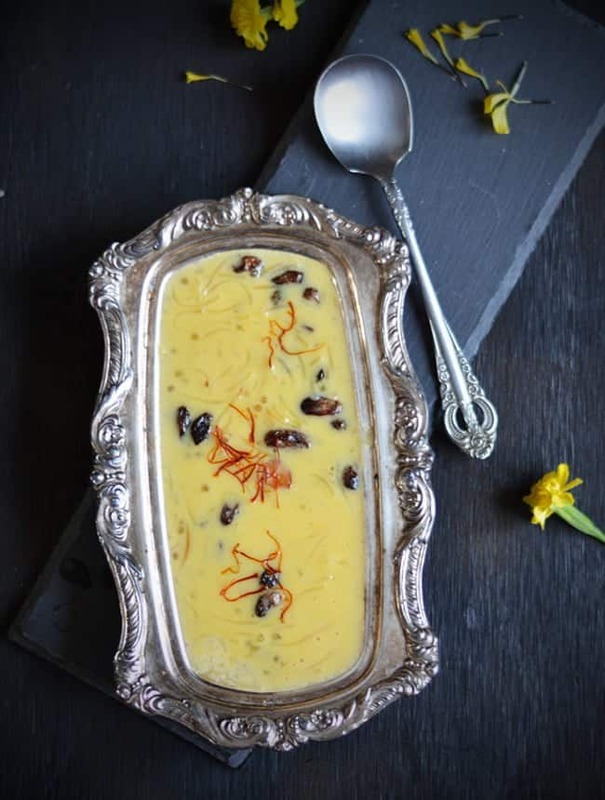 This payasam recipe yields sweet, mango flavored semi thick kheer. It has a great texture with semolina / semiya. Perfect recipe for making to large gatherings and potlucks. Payasam is the dessert served in South Indian full course meals. Generally, our authentic Tamil meals do not have much dessert varieties. And this mildly sweetened payasam is the important dessert. Maybe that’s the reason, I’m not with the sweet tooth and making dessert once in blue moon. But this mango semiya payasam would be loved by both sweet-toothed and non-sweet-toothed people. The important fact that it is very simple and easier to make with very few ingredients. And can be made well in advance when making for family gatherings, parties, and potlucks. The summer brings an abundance of varieties mango fruit. And this once such recipe which you should try in the mango season. On the nonfruit seasons, canned mango pulp would be the best choice. Where can we find the best mango pulp for this payasam recipe? Canned Alphonso mango pulp may be found in your nearby Indian grocery stores. This variety of pulp is really great, you would accept it if you have used it before. The semolina/semiya and sago/javvarisi, adds great texture to the payasam. But adding either one of these would working fine. What is sago/Javvarisi? They are tapioca pearls made in food factories. There are many varieties available in the market, some are bigger and some are tiny pearls. Personally to me, I like the large varieties. If you are looking for other mango recipes, then you may look into Mango Milkshake, Pineapple Mango Smoothie, Mango Dal. 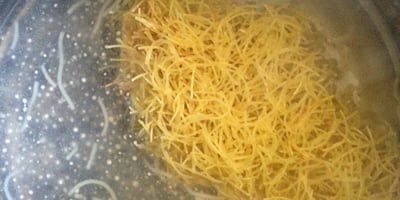 How to make mango semiya payasam / kheer? In medium flame, fry semolina until it turns golden brown in color. Remove it from the pan. In the same pan, add a tsp of ghee followed by cashews and raisins. Simmer the flame, and continue fry until it turns golden brown. And transfer it to another plate and keep aside to cool it down. The cooking time for these two ingredients is different. Sago takes a longer time to cook when compared to that of semolina. So keep a pan add some water 4 cups of water. Add sago and bring it to boil in medium flame. Cook it until it becomes transparent. 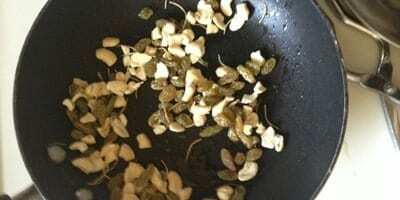 Add roasted semolina and continue to cook until both the ingredients are completely got cooked. To the same pan, add milk and mango pulp. In case you are calorie conscious, add condensed milk. I have not used condensed milk here in this recipe, instead, I have added a cup of whole milk. And I love this way. This picture shot immediately adding mango pulp. Simmer the flame, stir well and cook for about 5 minutes. Be cautious as milk can spills while boiling. Finally, add roasted cashews and raisins. For decorations, add few strands of saffron. But adding saffrons are optional. Serve mango semiya payasam hot or cold. Both variants are delicious in its own way. If you are planning to serve as a chilled dessert, bring payasam to the room temperature. And refrigerate it for a minimum of 4 hours. And it stays good for 2-3 days if refrigerated. 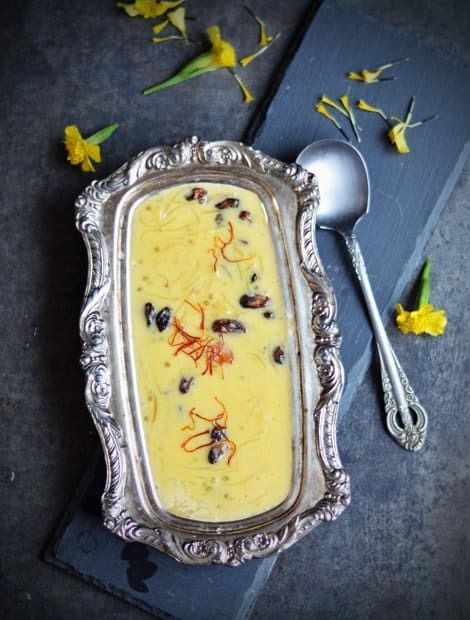 Mango Semiya Payasam, an Indian dessert made with vermicelli, milk and mango. Learn how to make this sweet with step by step pictures with no condense milk. This kheer is usually served on festivals in South India. In medium flame, fry semolina until it turns golden brown in color. Remove it from the pan. In the same pan, add a tsp of ghee followed by cashews and raisins. Simmer the flame, and continue fry until it turns golden brown. Set aside. Keep saucepan and add 2 cups of water. Add sago and bring it to boil in medium flame. Cook it until it becomes transparent . Add roasted semolina and continue to cook until both the ingredients are completely got cooked. To the same pan, add milk, sugar, and mango pulp. Simmer the flame, stir well and cook for about 5 minutes. Be cautious as milk can spills while boiling.